But, he added, âmoments like this show we didnât always do it right.â He promised that âthere are concrete steps coming up,â but he hesitated to say that Google has a toxic culture. Google employees in a park near the companyâs New York offices on Thursday. Mr. Pichaiâs tenure atop Google has been marked with internal clashes and external finger-pointing. Last summer, he fired a software engineer who circulated a memo questioning Googleâs diversity strategy and the tech industryâs gender gap. Pushback against the move, as well as support for it, came swiftly â the employee, James Damore, sued Google in January for workplace discrimination. Republican legislators have hounded the company with allegations of political bias. A video posted in September to the right-wing media site Breitbart showed Google executives, including Mr. Pichai, bemoaning the election of President Trump while at a company meeting in 2016. When asked about the companyâs intentions in China, Mr. Pichai insisted that âthereâs nothing weâre doing right nowâ on the so-called Dragonfly plan and that Google would consult with the federal government before making a move. 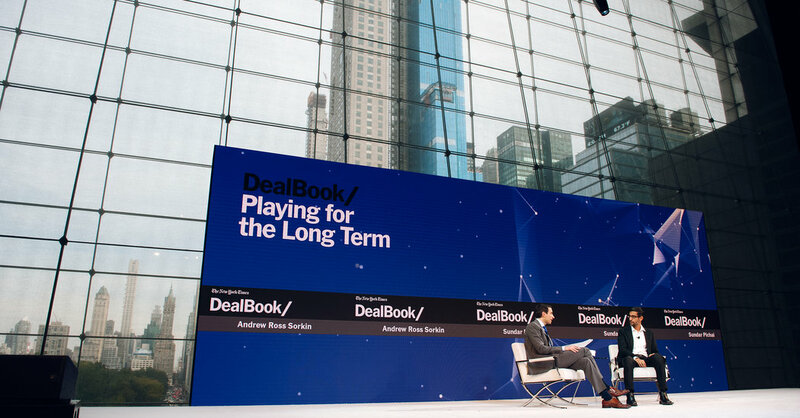 Peter Thiel, left, the PayPay co-founder, speaking Thursday at the DealBook conference with Andrew Ross Sorkin of The New York Times. How many times does some tweet or policy action or statement by President Trump leave Peter Thiel, one of his most vocal supporters, in disbelief? By many classic measures, Mr. Thiel has impeccable Silicon Valley credentials: co-founder of PayPal, a Facebook board member since 2005, a partner at the venture capital firm Founders Fund, sponsor of an ocean cleanup project, Bitcoin investments and a namesake investment company. But in many ways, he is a man on an island â and not just because he has New Zealand citizenship. His frequent defense of President Trump â a stance that Reed Hastings of Netflix referred to as âcatastrophically bad judgmentâ â has set him apart from much of the tech industry. âItâs a complicated thing to get right,â he said. And the presidentâs many unsupported, exaggerated or misleading comments about trade, immigration and even his own popularity? 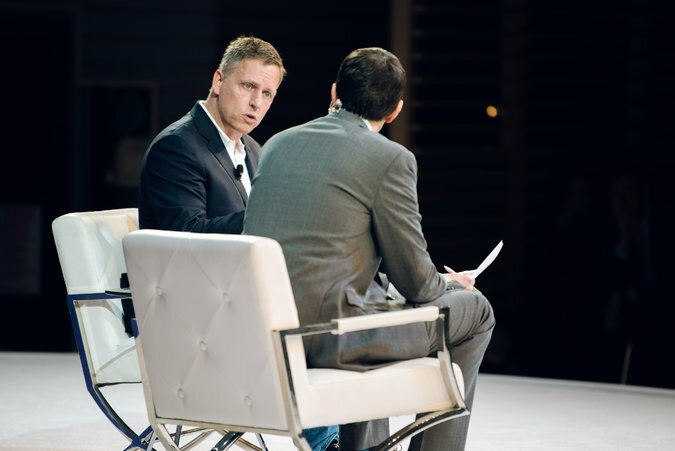 âI tend to think that the inaccuracies President Trump tells are basically exaggerations of the truth,â Mr. Thiel said. Andrew Ross speaks to Lloyd Blankfein. A month after relinquishing the role of chief executive officer at Goldman Sachs, Lloyd C. Blankfein was still defending the firm he now chairs. âItâs not good,â he added. On Oct. 1, the longtime investment-banking chief David M. Solomon succeeded Mr. Blankfein as C.E.O. Mr. Blankfein, 64, has stayed on as senior chairman of the board through the end of this year. Beyond joking about the idea of unfettered tweeting, he has said little so far about his future plans. On Thursday afternoon, looking relaxed in a navy suit and blue tie, he reminisced about his more than twelve years running Goldman and addressed some of the c-suite mysteries that had enveloped his tenure. As to whether longtime firm president Gary D. Cohn could have ever succeeded him as C.E.O., he was equivocal. As to whether he would have done anything differently to help Goldman weather the financial crisis, he said more proactive public relations would have helped burnish the firmâs image. 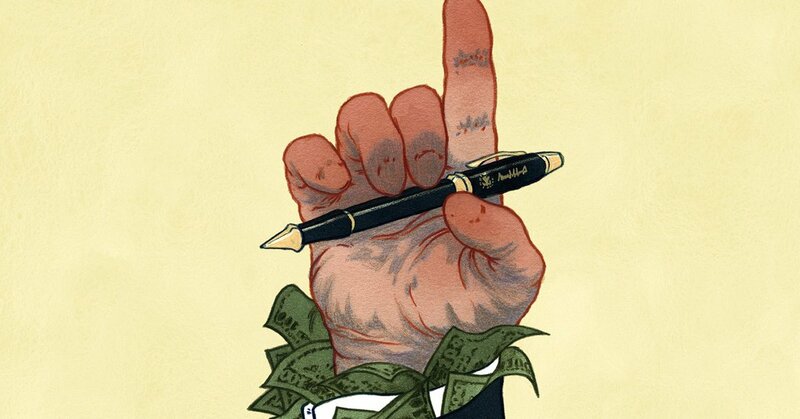 What could the Murdochs sell next? Lachlan Murdoch was named chief executive and chairman of his familyâs new television business shortly after his father, Rupert, sold most of the empire to the Walt Disney Company this year. 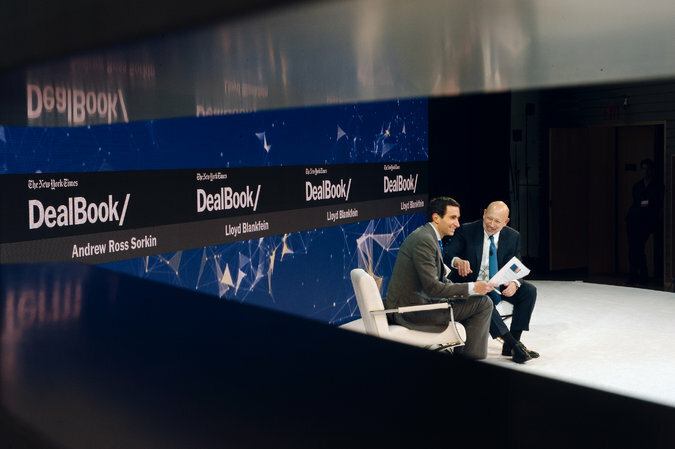 Making a rare public appearanceThursday at the DealBook conference, the 47-year-old executive discussed the familyâs latest round of deal making and what it could mean for the familyâs other assets. In particular, he spoke about the newspaper business under News Corp, a roster that includes The Wall Street Journal and The New York Post, as well as The Times and The Sun in Britain. The sale of Foxâs film and TV studios to Disney prompted a question about whether his father would ever sell The Wall Street Journal, which Mr. Murdoch acquired in 2007 for over $5 billion. The businesses that will remain under the control of the Murdochs after the close of the Disney deal early next year will center on news and sports. That means Lachlan will run Fox News, the Fox Broadcasting network and the FS1 cable sports network. Fox News, in particular, has come under heavy criticism for its close ties to the Trump administration. That has led to charges from critics that Fox News, and the larger Murdoch TV business, is actually a red state media organization. He cited figures that showed more Fox viewers are tuned to its sober news segments than the fiery opinion hours. âI think a lot of people donât realize that,â he said. Padma Lakshmi believes in redemption for men brought down amid the #MeToo movement. But that redemption should come from genuine remorse and understanding of the impact of oneâs actions, as Ms. Lakshmi said Thursday, and shouldnât be driven by a manâs being good at a certain job. It was one of the lessons that Ms. Lakshmi and her fellow panelist, Lisa Borders, sought to impress on their audience. The women discussed how the #MeToo movement continued to revolutionize gender dynamics across the workplace, culture, in social circles and in sports and education. Both have become vocal leaders. Ms. Lakshmi, the host and an executive producer of âTop Chefâ as well as a model, wrote an op-ed in The New York Times in September revealing that she was raped at the age of 16 and empathizing with women who waited years to disclose sexual assault. The op-ed was published as two women came forward to detail accusations against Brett Kavanaugh, the Supreme Court nominee, and President Trump questioned why one of the women, Christine Blasey Ford, didnât report the incident when it happened more than 30 years ago. Ms. Borders, formerly the president of the W.N.B.A., was named chief executive of Timeâs Up, a legal advocacy group for women in the workplace, last month, and her first day on the job was Thursday. The organization aims to tackle workplace discrimination around the world. The conversation was wide-ranging as Ms. Borders and Ms. Lakshmi described the need for a cultural shift, not just in the workplace, but particularly in how men are socialized and boys are raised. âWe need to stop equating aggression and masculinity because I think thatâs a big part of it,â Ms. Lakshmi said. Ms. Borders said there needed to be more transparency, particularly on the issue of salaries, so women would know if they were being underpaid. She said that companies should understand that policies and practices that empower women also help organizations as a whole. âWe add value,â Ms. Borders said. âAnd it lit fire,â she said. 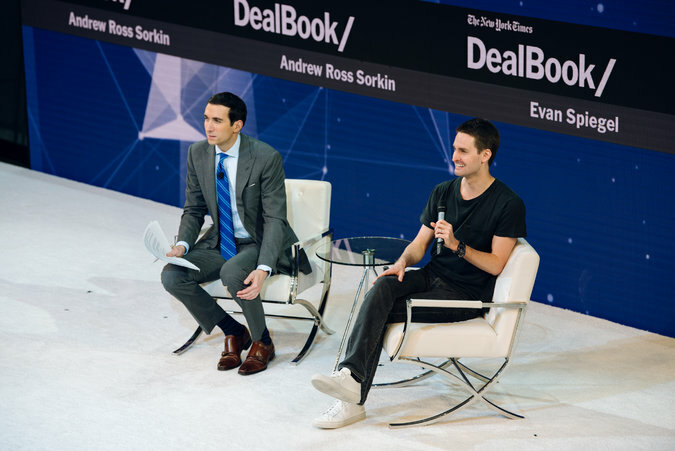 Evan Spiegel onstage with Andrew Ross Sorkin. Evan Spiegel, the chief executive of Snap, the maker of the disappearing-message app Snapchat, said broadcasting regulations offer a framework for how to think about the dangers of social media. âIf you look historically at America, a place thatâs always celebrated things like free speech, weâve actually always thought about broadcasting really differently than how we thought about communication,â he said. While Americans have long accepted most forms of speech, even the distasteful kind, they have been less tolerant when that speech is widely distributed, he said, noting that broadcasters are subject to regulations on what they can and canât say or show. âI think weâre in this weird moment in time where this behaviorâs been enabled technically and the regulatory framework actually hasnât caught up to that reality,â Mr. Spiegel said. When asked if he was suggesting that social media should be regulated, Mr. Spiegel said only that there was much to learn from how Americans have thought about the responsibility of broadcasters in the past. The challenge, though, is identifying what, exactly, broadcasting is, he said. Some have argued that social media has enabled social change, but Mr. Spiegel said that view is overly simplistic. Andrew Ross Sorkin speaking with Kenneth C. Frazier. To address corporate Americaâs diversity problem, Ken Frazier sees a lesson in his own past. The chief executive of Merck is one of only three black chief executives in the Fortune 500. But growing up as the son of a janitor in inner-city Philadelphia, Mr. Frazier faced an opportunity gap. Fortunately for him, a desegregation policy and a 90-minute daily bus ride that gave him time to read helped to overcome it. âI look back at my own life and I realize that I was treated in an extraordinary way in this country,â he said. As the nation increasingly self-segregates, Mr. Frazier said, the workplace is one of the few remaining places that offers that same opportunity for people of different backgrounds to interact â and business leaders, he says, have a responsibility to uphold that basic American value. That conviction led Mr. Frazier to step down last year from President Trumpâs manufacturing advisory council, the first of many executives to do so after the president equivocated in his response to white nationalist violence in Charlottesville, Va., in August 2017. 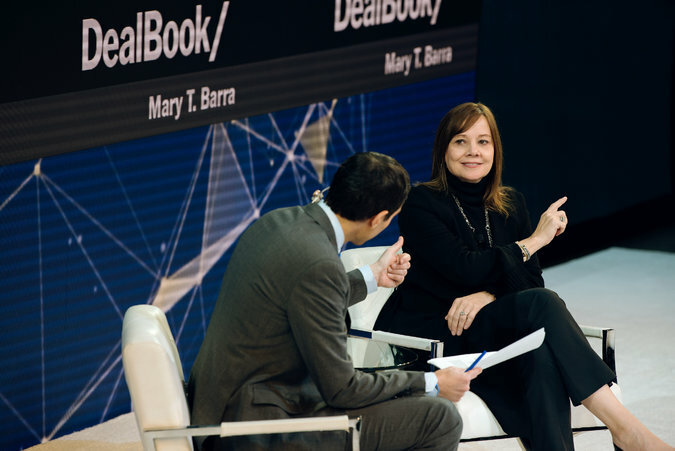 Mary Barra spoke to Andrew Ross Sorkin at the Dealbook conference. Mary T. Barra, the chief executive of General Motors, said that the company plans to roll out a ride-sharing service that would rely on autonomous vehicles in 2019, a development that would advance the already-heated race to bring self-driving cars to market. âWeâre on track, with our rate of learning, to be able to do that next year,â Ms. Barra said, adding that the company had a strategy to show how its vehicles are safer than human drivers. The vehicles can currently run safely at speeds of up to about 30 miles per hour, and the service will be limited to a small geographical area, Ms. Barra said. She did not say where the service would operate, but noted that the company has been testing in San Francisco. Autonomous vehicles rely on what Ms. Barra described as âa suite of sensors,â including radar, cameras and a technology known as lidar. G.M. is focused on advancements to lidar, which will drive down costs and enable the vehicles to travel at higher speeds, she said. After substantial investments this year from SoftBank Group of Japan and Honda, G.M.âs autonomous vehicle unit, Cruise, is now valued at $14.6 billion. âWe do believe in an all-electric future,â she said. 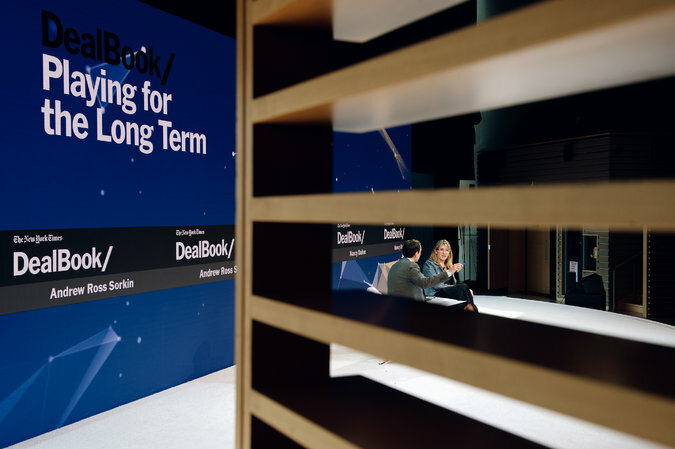 Andrew Ross Sorkin speaks with Nancy Dubuc, the chief executive of Vice Media, at the DealBook Conference in New York. Nancy Dubuc, the newly installed chief executive of Vice Media, announced at the conference today that the company will be profitable by âthe next fiscal year.â That would be an important milestone for a business that was most recently valued at $5.7 billion. Cost cutting will help. But Ms. Dubuc characterized the forthcoming changes as a way to become more efficient. âWhen you have expansion everywhere, youâre obviously going to have duplication everywhere too,â she said. Vice started as a free punk magazine in Montreal in 1994 and has traded on its irreverent, brash tone to become a global media company with about 3,000 employees. Backed by media giants like the Walt Disney Company and 21st Century Fox, Vice now includes an advertising agency, a TV network, a film-production business and programs on HBO. Ms. Dubuc, 49, also has the task of solving the companyâs longstanding issues with sexual harassment. In December, a New York Times investigation detailed the mistreatment of women at the company. Ms. Dubuc praised Mr. Smith for his response. âShane did a powerful thing and that was to take seriously the changes that needed to happen at Vice,â she said, later adding that her being named aschief executive was an important signal for the company to send. âI could have a pretty dramatic impact,â she said. 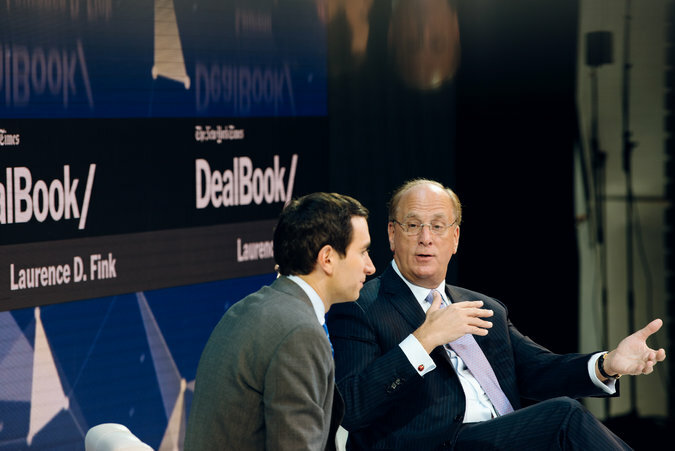 Laurence D. Fink of BlackRock, right, spoke with Andrew Ross Sorkin of The New York Times. For someone who speaks often and loudly about taking a stand and doing good, Laurence D. Fink of BlackRock spends a lot of time thinking about gray areas. Mr. Fink, the founder, chairman and chief executive of the worldâs largest asset manager, said that dropping out of Saudi Arabiaâs big investment conference last month was a âhard decision.â So was the choice earlier this year to offer investment options stripped of stocks in gun manufacturers and retailers. 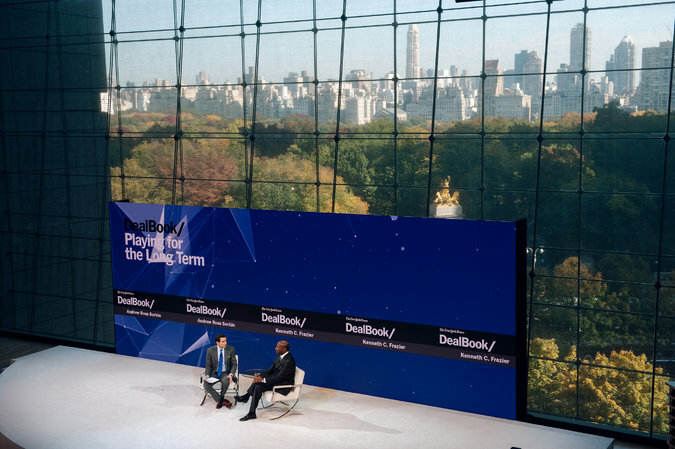 âThese things are not black or white,â he said on Thursday at the DealBook conference in New York. BlackRock has $6.5 trillion under management, giving it great influence over many of the worldâs top public companies. In a conversation that ranged from tariffs to bitcoin, Mr. Fink returned repeatedly to ideas about corporate accountability. Earlier this year, he sent an open letter pressing public firms to consider not just their bottom lines, but also the broader community â a social responsibility manifesto forged through years of personal experience, public pressure and secret meetings. Mr. Fink withdrew last month from the high-profile investment conference in Riyadh amid allegations that Jamal Khashoggi, a prominent Saudi journalist, had been murdered and dismembered at a Saudi consulate in Turkey. But he stressed that his attention to social responsibility is not a passing fad. Steve Ballmer, the former chief executive of Microsoft, concluded his presentation on Thursday with the results of a poll he recently helped run: 61 percent of the people surveyed cared about using researched facts to help form their opinions on policy, beating the 54 percent who said their values shaped their opinions. For Mr. Ballmer, that is central to a project he has been working on since he retired as chief executive of Microsoft in 2014 and has poured millions of dollars into: USAFacts, a nonpartisan database of federal, state and local government revenue and spending. âIâve spent the better part of four years trying to understand where government gets its revenue, where it spends its revenue,â Mr. Ballmer told the audience on Thursday. In a wide-ranging presentation, Mr. Ballmer ran through some highlights of the types of data his website provides, hitting on hot-button issues in the upcoming 2018 midterm elections. Mr. Ballmer has called USAFacts âthe equivalent of a 10-K for government,â referring to the kind of annual financial filings that companies make. In charts, Mr. Ballmer showed how he believes USAFacts can help Americans filter the increasingly convoluted noise. On immigration, for example, the number of undocumented immigrants in the United States rose from about 10.5 million to 12.1 million in recent years, according to USAFactsâ analysis of government data. The number of border agents has risen sharply from about 4,000 to 19,000 over the same period, while border apprehensions have decreased from roughly 1.7 million to 300,000, Mr. Ballmer said. The numbers raise natural questions, Mr. Ballmer said. Why are there more border agents today, fewer apprehensions, but more undocumented immigrants? 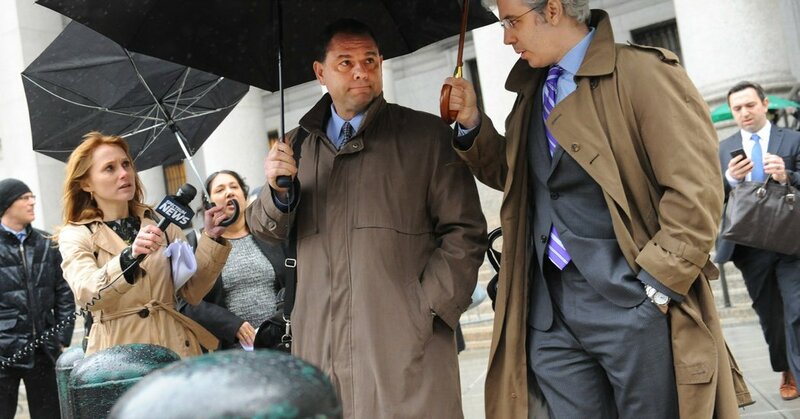 From left: David Gelles, John Hope Bryant, Thasunda Duckett and Stephanie Cohen. How can corporate America improve diversity? 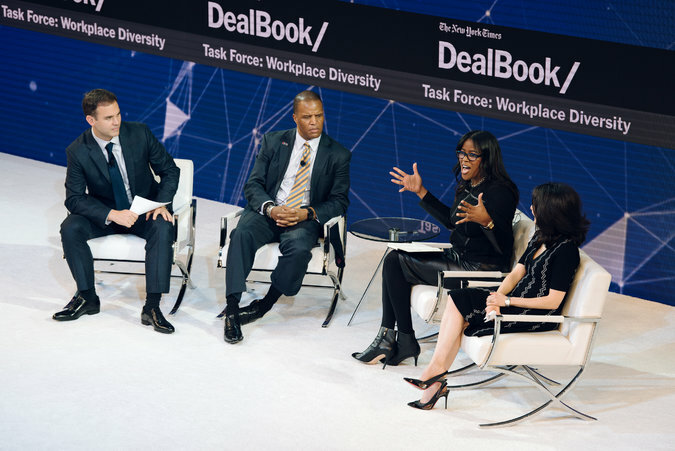 David Gelles, Corner Office columnist at The New York Times, presented the findings of a DealBook conference task force on diversity in the workplace, characterizing it as a âreally lively discussionâ that could have gone on for hours. Nonetheless, âwe made a remarkable amount of progress in an hour,â he said. â¢ Aspirational goals are in general a good thing, but theyâre not enough, said Stephanie Cohen, chief strategy officer for Goldman Sachs. Companies also need to be transparent in how theyâre achieving those goals. In addition, there canât be separate business and diversity scorecards â diversity needs to be part of the business. â¢ Legislation and federal policies need to play a role. John Hope Bryant, founder and chief executive of Operation HOPE spoke about the need for a federal policy to give credit to companies that offer internships and apprenticeships, and when the effort is especially aimed at women and people of color, âyou should get a double credit for that double reach,â he said. â¢ Companies have to realize diversity is a long-term goal, and it has to be baked into its culture. âYou can have policy and tactics, but if the culture is not ready to receive it,â it wonât work, said Thasunda Duckett, the chief executive of consumer banking at JP Morgan Chase. And everyone has to join the conversation, she said. From left: Rebecca Blumenstein, Peggy Johnson, Pozen Fellow and Dipayan Ghosh. How can we use A.I. ethically? 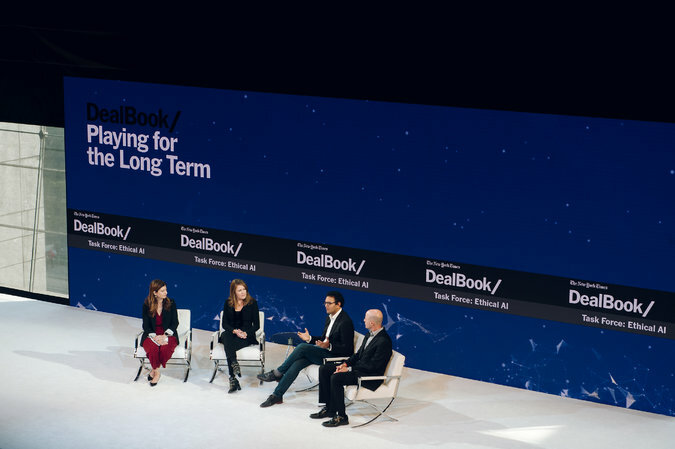 Rebecca Blumenstein, the deputy managing editor of New York Times, described the conversations of a DealBook conference task force, intended to establish guidelines on how to ethically implement A.I., as one of the âhighest level discussions she has ever seenâ about the technology. 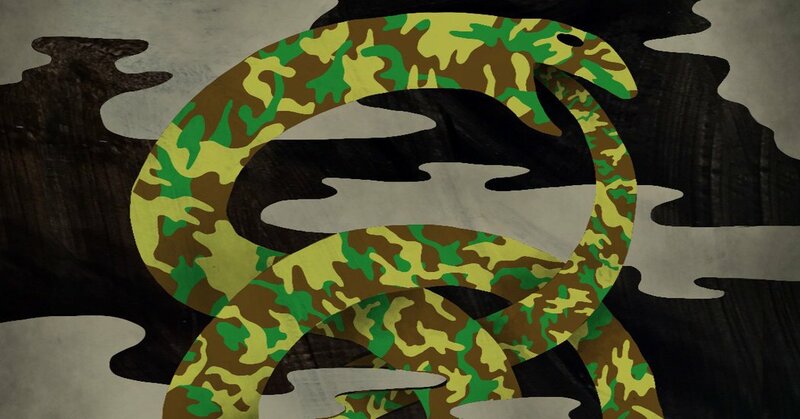 â¢ Microsoft announced last month that it would sell military and intelligence agencies whatever advanced technologies they needed for the countryâs defense, a move that came amid scrutiny over tech companiesâ role in the development of next-generation cyberweapons. The task force concluded on Thursday that a partnership between tech companies and government is a good thing. The government should have access to the best technology available, said Microsoftâs executive vice president of business development Peggy Johnson.  â¢ Companies should take care to scrutinize their machine learning initiatives (and algorithms in general) for biases that may be passed on from their creators, said Dipayan Ghosh, a Pozen Fellow at the Shorenstein Center on Media, Politics and Public Policy at Harvard University. These technologies should be developed with greater consideration for the public interest. â¢ In New York City, when considering artificial intelligence in transportation, companies should be transparent with the data they use in order to ensure the technologies are a benefit to society, said Cordell Schachter, the chief technology officer of the New York City Department of Transportation. Next : Blake Griffin Isnât Bitter. Detroit Has Made Him Better.